A blog post by “Small Change, Big Difference” chief food sustainability scientist, Bojana Bajzelj. You can read more of Bojana’s work here, here and here. 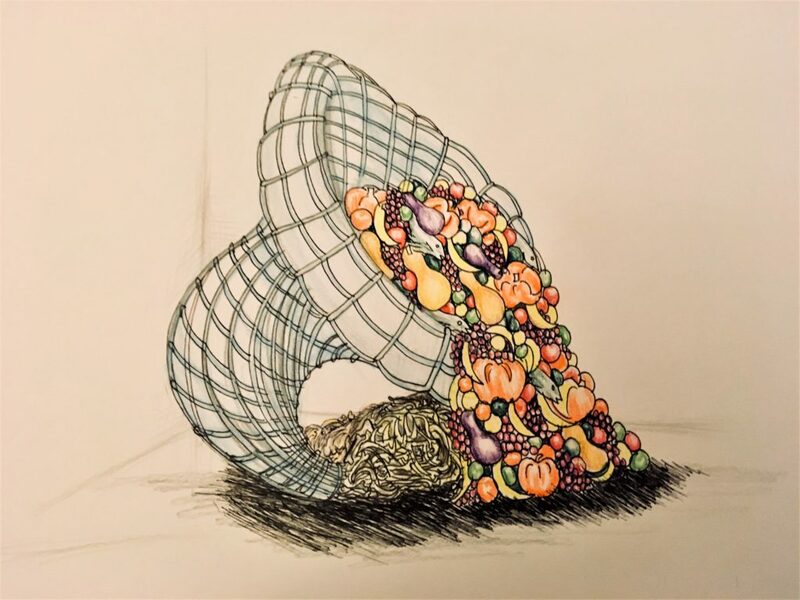 I adore the artwork that won the “Small Change, Big Difference” student art competition, ‘Cornucopia, The Horn of Plenty’, by young London artist, Megan Dinnis. For me, Megan hit the nail on the head. Her sculpture shows how the abundance of food available to us leads to mountains of waste. And that’s not the only problem. The horn of plenty is an ancient motif in art. It represents the fact that we humans have almost universally, across cultures, always dreamt of having plentiful food. For many of us, this dream is now a reality. Our supermarkets, fridges and dinner tables are laden with all sorts of food. I have always loved the idea and the image of Plenty. It’s even the title of a cookbook by my favourite London chef, Yotam Ottolenghi! But “plenty” comes at a cost; a cost both people and the planet are paying dearly. First of all, like Megan’s sculpture shows, plenty almost always leads to waste, which in itself is a problem. Food waste that rots in landfill creates methane, a powerful greenhouse gas. So, the least we can do is make sure we put our biodegradable waste – from teabags and banana peels to chicken bones or other inedible bits of food we can’t eat, in the right bin. Most London councils offer a separate collection for food waste, which means that instead of going to landfill, it will be recycled into compost or some form of energy (either electricity or gas). Many people think producing over-abundant food is not a huge issue, because, unlike plastic, food is natural. And yes, indeed, it is. But that also means that it’s something we take away from nature. In other words, food production competes with nature and wildlife for space, water and even rays of sunshine. The more food we stuff in our fridge, the less food, space and water remains for other wild animal species on this planet. That is particularly true for rearing livestock, which takes more space and resources than any other type of food production. And for what? For a quarter of it to end up in the bin? And then there’s another problem too. Lucky are those that, when faced with all this delicious food so often, have the self-discipline to stick to just what their bodies need. Most people, myself included, will eat food that is put in front of them. The more that is, the more we eat. And unlike in Megan’s horn, it’s not just beautiful fruit and vegetables. It’s actually more often the biscuits and crisps that are available everywhere and all the time. And so, we have the problem with keeping our waistline in check; so many have their quality of life diminished by obesity, diabetes and heart disease. Also hidden in the shadow of the horn are all those that cannot afford the abundance many of us can. So I think it’s time we rethink our dream of “Plenty”. Yes, there is a time and a place for it (Christmas is nearly here! ), but for everyday life, let’s aim instead for “Just Enough”. Let that be our motto when we do our weekly shop, order food for the meeting (most caterers seem to think everyone eats like a lion, so under-ordering by 25% is, in my experience, safe) or prepare snacks for our birthday parties. Getting it just right is not easy, but that is what should become the image of the perfect host or the perfect family cook (rather than providing too much, which should slowly become something that is frowned upon – unless doggy bags and leftover plans are also in the mix). Our bodies, and strangely, the actual real lions, will be thankful for it.